Personalized Calendar printing is another service provided by our company. A beautiful personalized calendar certainly leaves a long-lasting impression on the person it is gifted to. Recall those lovely memories which fill your mind with freshness, with each changing month by this personalized romantic calendar. You can get your multiple shades of love and romance printed on this personalized calendar that you have clicked and this item can be chosen as an exclusive romantic gift. 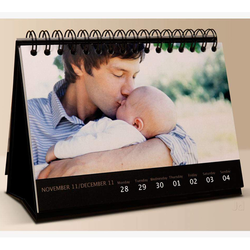 Calendar - Personalize Calendar With The Photos Of Your Loved Ones For Each Month! Stick These Calendars On The Wall Or Put Them On Your Desk! By utilizing skills of our dexterous workforce, we are manufacturing and supplying a comprehensive assortment of Personalized Printed Photo Calendar. Widely used for the advertising purpose.